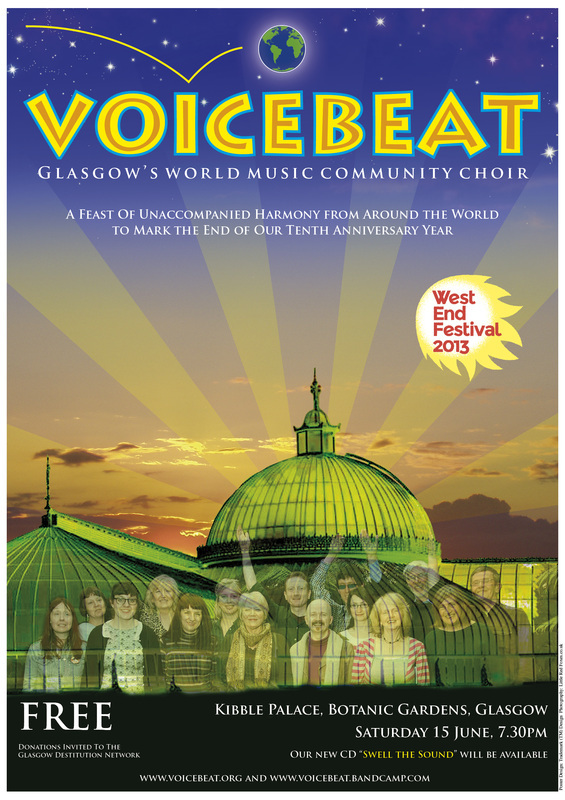 We marked the end of our anniversary year with a concert on Saturday 15 June as part of the West End Festival. We were lucky to be performing in the atmospheric surroundings of the Kibble Palace. Not only is it visually gorgeous, the acoustic is excellent. We asked for donations to the Glasgow Destitution Network which provides food and shelter to asylum seekers threatened with homelessness and starvation. Read more about their work here and in this Scotsman article. We're awaiting the final figure but we raised something like £500. The concert poster (right) designed by Tom Malone, is available full-size here and the programme notes (by Harry Campbell) are here. Video of the songs we sang at concert (filmed by to Susan Gibb) is on our YouTube channel.